The acting spokesperson for the family of the late DNC staffer and suspected WikiLeaks source Seth Rich is a man named Brad Bauman who happens to be directly connected to Media Matters founder and George Soros-backed propagandist David Brock. This recent discovery comes at a time when the interest in the Seth Rich case has reached a peak. Just earlier today, “independent investigators discovered that Bauman runs a foundation in his name,” Disobedient Media reports. It is called the Bauman Foundation and on the Board of Directors sits David Brock, a self-loving, narcissistic, ego-maniac who has made a career of attacking people on both sides of the aisles, but since 1997 has aligned himself with the Clintons, Soros, and the ravenous, illiberal left. He is the founder of Media Matters for America, Correct the Record, and Shareblue. Brock is known for his use of “censorship” and “online harassment”. Disobedient Media has previously reported that Brock and his affiliated organizations have ties to the Chinese government, foreign special interests and organized crime. Brock’s ties to foreign interests may mean that he is in violation of the Foreign Agent Registration Act, 22 U.S.C. § 614. Brock’s organizations have been active in harassing and attacking journalists looking into the Seth Rich story. Affiliates of Brock have taken to Change.org to attack companies advertising with Fox 5 DC. The boycott campaign is organized by Karl Frisch, a former senior fellow at propaganda group Media Matters for America who spent his time at the organization helping develop “long-term strategy to target Fox News as a political actor.” Media Matters has also targeted Fox News anchor Sean Hannity for discussing the case. David Brock’s personal involvement with Brad Bauman only serves to intensify speculation about political interference in attempts to uncover answers concerning the death of Seth Rich. Disobedient Mediahas previously noted an August 2016 tweet from Wikileaks which revealed that Bauman is a crisis public relations consultant working with the Pastorum Group. A media release from the Pastorum Group reveals that Bauman previously worked for the DNC and the Service Employees International Union (SEIU). The SEIU is the client of a group founded by Democratic operative Robert Creamer. In 2016, Creamer was implicated in footage obtained by journalist James O’Keefe which revealed that Creamer was engaging in voting fraud and violent disruption of political events, sometimes using his connections to unions who were as clients of his. Legal representatives sending cease and desist letters on behalf of the Rich family also have ties to the law firm at the center of the Whitewater controversy. Brad Bauman has in the past week insisted that anyone who continued to push the story either had a “transparent political agenda,” or were a sociopath. But given the intense attacks which organizations tied to David Brock have engaged in against any journalists discussing the Rich case, Brock’s connections to Bauman intensifies questions about whether or not the DNC has become involved in the Seth Rich case out ulterior motives. Kim Dotcom, a famous internet entrepreneur and hacker, admitted today he was part of the operation along with Seth Rich to get stolen DNC emails to Wikileaks. 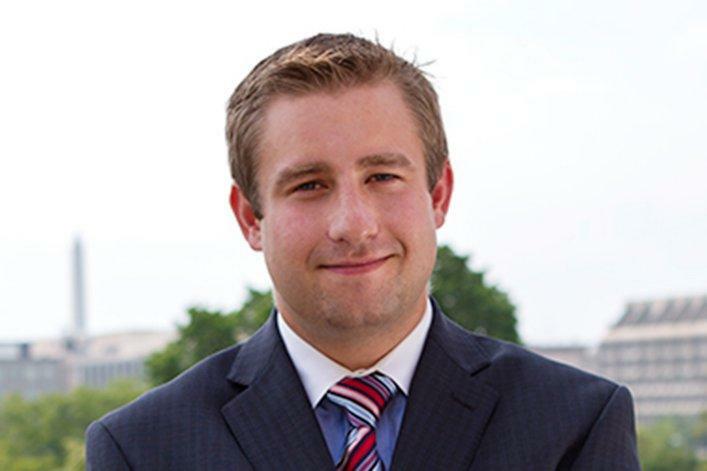 On July 8, 2016, 27 year-old Democratic staffer Seth Conrad Rich was murdered in Washington DC. The killer or killers took nothing from their victim, leaving behind his wallet, watch and phone. Shortly after the killing, Redditors and social media users were pursuing a “lead” saying that Rich was en route to the FBI the morning of his murder, apparently intending to speak to special agents about an “ongoing court case” possibly involving the Clinton family. The Metropolitan police posted a reward for information on Rich’s murder. 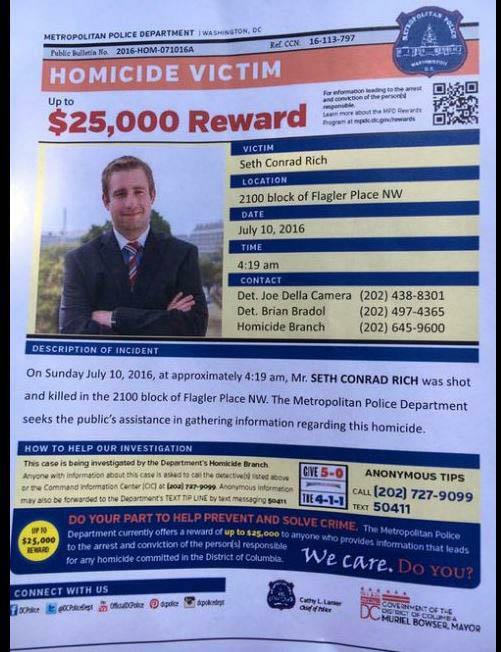 in August Wikileaks offered a $20,000 reward for information on the murder of DNC staffer Seth rich. Julian Assange also suggested in August that Seth Rich was a Wikileaks informant.